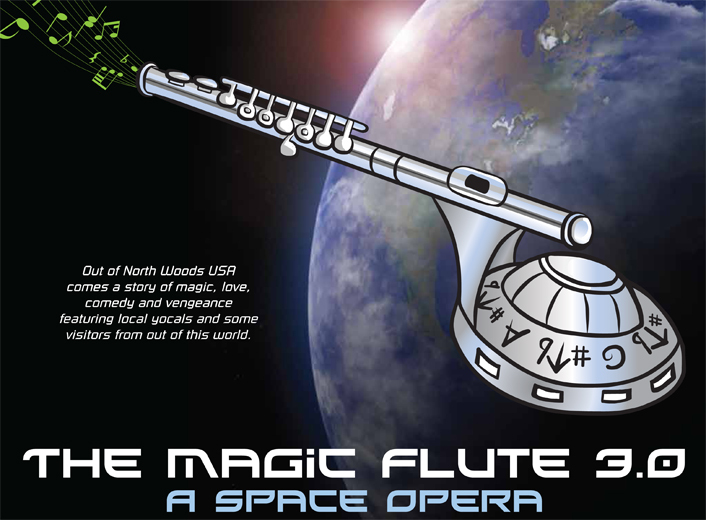 Petite Opera Productions: Patrons think Petite Opera's Sci-Fi "Magic Flute 3.0" is out of this world! A Chicago-based organization specializing in taking the stuffy out of opera; small scale operas, English only, great performers. Click here to read and accept the Terms and Conditions of Use which govern this site. Patrons think Petite Opera's Sci-Fi "Magic Flute 3.0" is out of this world! Catch the Aliens before they leave Park Ridge! Petite Opera's new world premiere English translation and Science Fiction adaptation is a hit with Earthling audiences! Starting with the overture (a back story to the aliens landing on Earth), audiences loved this new translation and all of its' fun cultural references. Sci-Fi, aliens, Mozart, the North Woods and the CIA combine in this world premiere of a new Petite Opera English translation. Sarastro and his alien community from Vekran are out in the galaxy promoting their cause. They land on Earth to find Sarastro's exiled Rimulan wife, the Queen of the Night and her Borg-like Ladies trying to assimilate into North Woods USA, near Canada. Entitled trust-fund guy, Tamino, seeks to unite with the pair's daughter, Pamina. Aided by simple hunter--Papageno--and Free Spirits from the intergalactic police force, they seek to find their loves, their balance, and escape evil. "It was just so fun! With Star Wars coming back in a few months, this was a great way for me to get my fix of sci-fi and see an opera at the same time!" "This production, with the Sci-Fi theme was really fun! I'm sure I didn't catch all of the jokes, but my husband is a big Star Trek fan, and he got all of them! The whole cast had tremendous voices." Don't miss it! There are only three performances remaining! 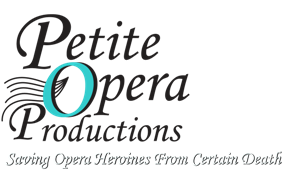 Call 847-553-4442 or email us at tickets@petiteopera.org to reserve your tickets for payment by cash or check at Box Office on performance date. For credit card orders, visit our PURCHASE TICKETS page. Please note: Reservations and Credit card orders accepted up to 4 hours prior to show time. A convenience fee is applied to all credit card orders at checkout.